PUV DISCOUNTS: Energy Secretary G. Alfonso together with Pilipinas Shell Petroleum Corp. President and CEO Cesar G. Romero signed the Memorandum of Agreement (MOA) between the DOE and Shell on 1 March 2018 at the DOE Media Center giving fuel discounts to public utility vehicles as part of their Corporate Social Responsibility (CSR) programs. 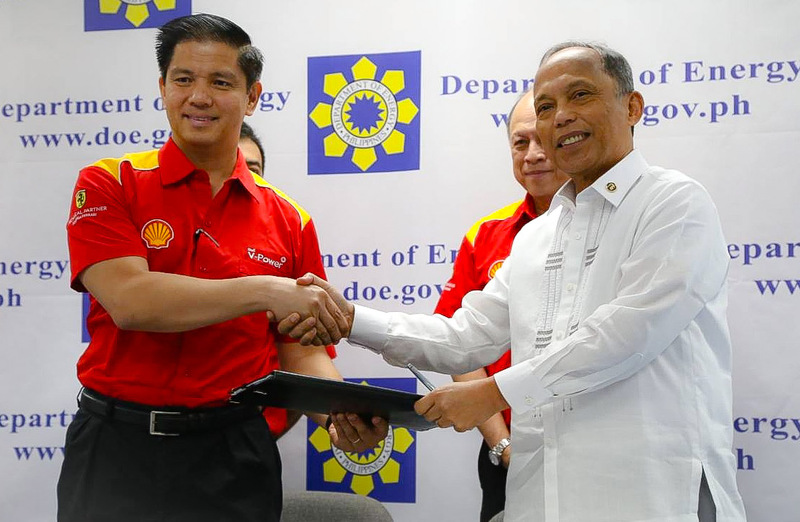 The agreement, which is effective upon the date of MOA signing, includes PhP1.00 per liter discounts on liquid fuels in selected Shell stations across the country. This initiative aims to mitigate the impact of Tax Reform for Acceleration and Inclusion (TRAIN) Law on oil prices and to avert transport fare increases. Other participating oil companies are Petron Corp. and Phoenix Petroleum Philippines, Inc.
Good news for public utility vehicles and commuters. The Department of Energy (DOE), in partnership with Petron Corp., Pilipinas Shell Petroleum Corp. and Phoenix Petroleum Philippines, Inc., today signed a Memorandum of Agreement (MOA) to provide fuel discounts to public utility vehicles (PUVs). “These corporate social responsibility (CSR) programs of the oil companies are aimed to mitigate the impact of Tax Reform for Acceleration and Inclusion (TRAIN) Law’s impact on transportation fares,” said Energy Secretary Alfonso G. Cusi. The CSR programs will expand the oil companies’ existing discount programs for PUJs, which includes the increase in the number of participating retail stations, higher discounts and inclusion of other PUVs. “With these fuel discount and other CSR programs, we are hopeful that operators of jeepneys and buses will also help lessen the impact of TRAIN to consumers by not increasing the transport fares,” Cusi underscored. Sec. Cusi added that the wisdom of TRAIN Law is to raise funds to finance major infrastructure projects and relevant projects of the government to uplift the lives of the Filipino people and the next generations to come. 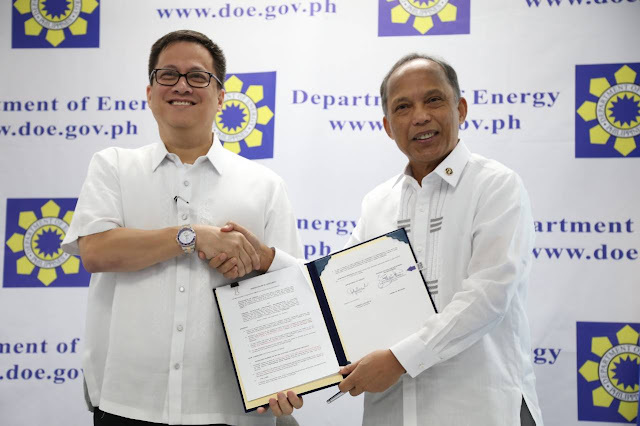 “Energy efficiency and these CSR schemes are being pursued by the DOE to maximize the benefit of having a higher take home pay for lower and middle class income taxpayers,” Cusi concluded. 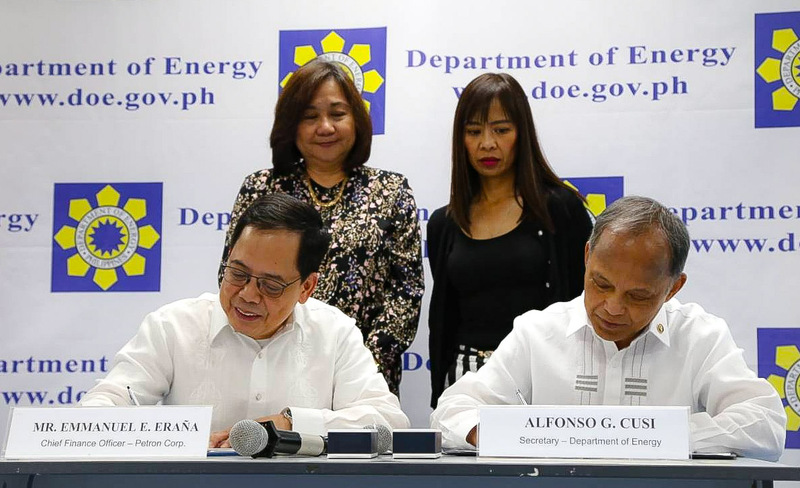 The MOA signing between the DOE and oil companies for fuel discounts on PUVs as part of their CSR was opened by DOE-Assistant Secretary Leonido J. Pulido III. The event was attended by the DOE Oil Industry Management Bureau, stakeholders from the oil industry and the members of the media. PUV DISCOUNT LANES: To reduce the impact of oil price increases due to the excise tax provision under the TRAIN Law, Energy Secretary G. Alfonso together with Petron Corp’s Chief Finance Officer Emmanuel E. Eraña signed on 1 March 2018 at the DOE Media Center the Memorandum of Agreement (MOA) between the DOE and Petron giving fuel discounts to public utility vehicles. 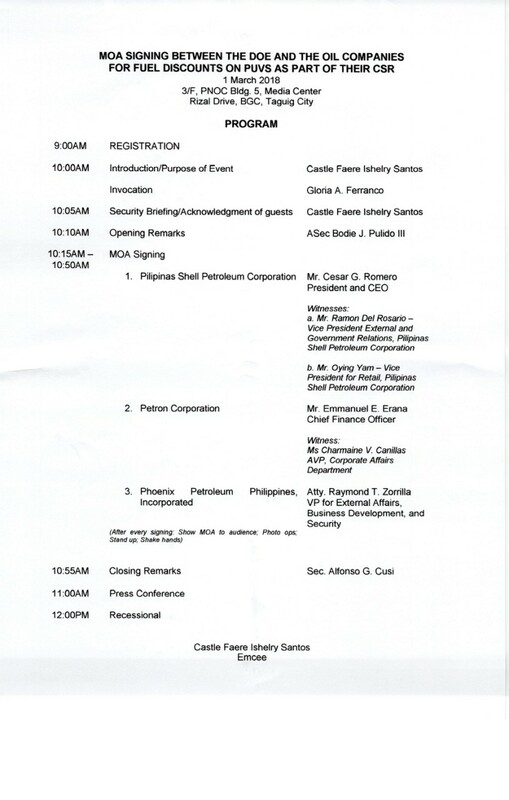 Based on the MOA, Petron’s Corporate Social Responsibility (CSR) program will take effect ten days after the signing of the MOA. It entails at least PhP1.00 per liter discounts on liquid fuels in selected Petron stations across the country. This initiative also aims to temper petitions for transport fare increases of PUVs with the implementation of the TRAIN Law. 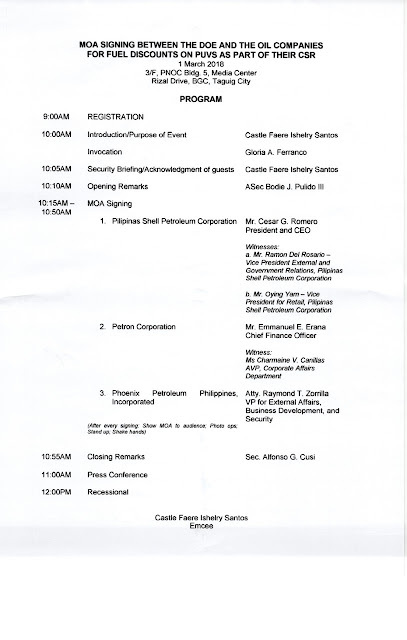 Other participating oil companies are Pilipinas Shell Petroleum Corp. and Phoenix Petroleum Philippines, Inc. EXPANDING FUEL DISCOUNTS: About 150 gas stations will give discounts to PUVs after Energy Secretary G. Alfonso together with Phoenix Petroleum Philippines, Inc. VP for External Affairs Atty. Raymund Zorilla signed on 1 March 2018 at the DOE-Media Center the Memorandum of Agreement (MOA) between the DOE and Phoenix Petroleum giving fuel discounts to public utility vehicles. According to Zorilla, Phoenix Petroleum’s Corporate Social Responsibility (CSR) program provides at least PhP1.00 per liter discounts on liquid fuels in selected stations across the country. 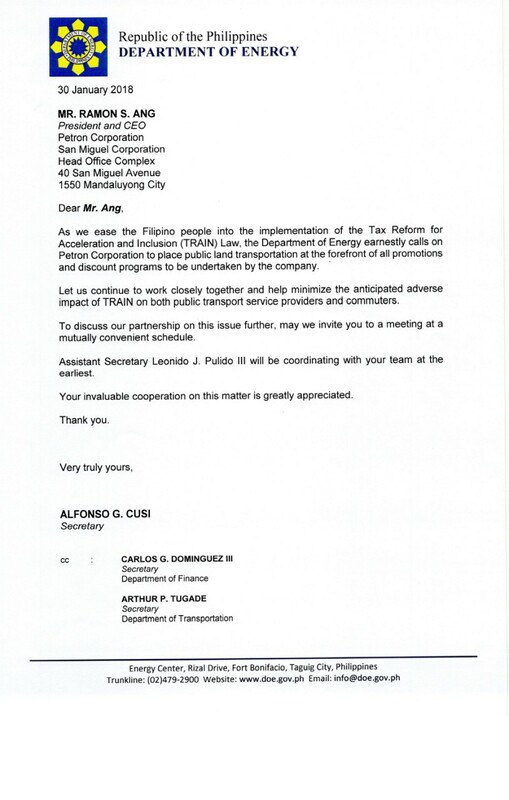 Together with other participating oil companies, Petron Corp. and Pilipinas Shell Petroleum Corp., Phoenix Petroleum wants to mitigate the impact of the TRAIN Law on PUVs and commuters.